One of the typical life zones on mountains is the montane forest: at moderate elevations, the rainfall and temperate climate encourages dense forests to grow. Holdridge defines the climate of montane forest as having a biotemperature of between 6 and 12 °C (43 and 54 °F), where biotemperature is the mean temperature considering temperatures below 0 °C (32 °F) to be 0 °C (32 °F). 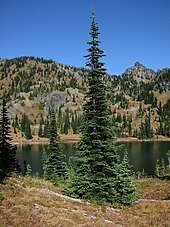 Above the elevation of the montane forest, the trees thin out in the subalpine zone, become twisted krummholz, and eventually fail to grow. Therefore, montane forests often contain trees with twisted trunks. This phenomenon is observed due to the increase in the wind strength with the elevation. The elevation where trees fail to grow is called the tree line. The biotemperature of the subalpine zone is between 3 and 6 °C (37 and 43 °F).